Accountability Counsel and local civil society organizations support tea workers and their families in Assam, India, in their efforts to improve and protect their health, wellbeing, and human rights on tea plantations. The World Bank Group’s International Finance Corporation (IFC) owns 16% of these plantations. Tea workers in Assam mostly belong to Adivasi or Indigenous communities forcibly brought from central India over 150 years ago under British rule. Ever since, workers have been trapped in a cycle of servitude for generations, depending on their employer for almost every aspect of their lives. In February 2013, three local civil society organizations – many themselves relatives of tea workers – filed a complaint to the World Bank Group’s Compliance Advisor/Ombudsman (CAO). In this complaint, they raised concerns about inhumane labor and working conditions on three plantations run by Amalgamated Plantations Private Limited (APPL). The plantations are majority owned by the Tata Group (41% by Tata Global Beverages and 25% by Tata Investment Corporation). The complaint cites long working hours, inadequate compensation, poor hygiene and health conditions, coercion and pressure of plantation workers, and lack of freedom of association. All of these conditions violate IFC’s Performance Standards. The complaint to the CAO also raises concerns about the worker shareholder program. Though the program is intended to provide workers with greater agency in the company, many workers have instead been pressured into buying shares, often without information on what it means to be a shareholder or the risks of investment. In November 2016, the CAO released a scathing investigation report that found that this shareholder plan had failed as APPL workers were not given proper information about their rights as shareholders. It also found that living and working conditions were substandard and wages were not protecting the health of workers. The IFC was supposed to create an action plan that would directly, and in a timely fashion, address the CAO’s findings. Unfortunately, the IFC ignored most of the findings and endorsed a limited action plan that only addresses a small subset of issues. In July 2017, Accountability Counsel and our partners met with workers from three APPL plantations in Assam to verify whether the limited promises under the action plan were being fulfilled. The exposé – called Project AccountabiliTEA – documents, through photographic evidence, that the IFC had broken its promises yet again. The IFC issued a letter of response to the CAO Monitoring Report in March, 2019. Follow www.accountabiliTEA.org for the latest on Accountability Counsel’s support for tea workers and their families as they seek just wages and conditions on tea plantations in Assam, India. The following video reveals the abysmal living and working conditions on certain tea plantations in Assam, as reported by CNN in February 2019 and BBC in September 2015. 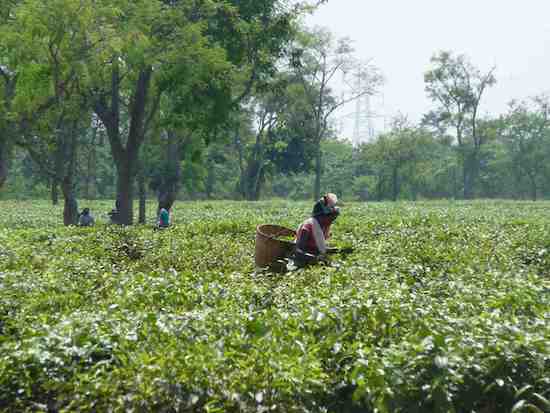 The workers on many of Assam’s tea plantations were brought to the state from their traditional homeland during British rule. These Adivasi families have thus been working in near total cultural isolation for generations. They are chronically underpaid and subject to working and living conditions that are unsanitary, dangerous, and sometimes deadly. In 2009, the International Finance Corporation (IFC) invested $7.8 million in a project to establish Amalgamated Plantations Private Limited (APPL), a company that would acquire and manage tea plantations owned by Tata Tea Limited. Tata Global Beverages owns and markets the Tetley brand, making it the second largest player in the global tea market. The project would enable APPL to implement a sustainable “worker-shareholder” model to make shareholding—which is currently dominated by the IFC (16%), TATA Global Beverages (41%), and Tata Investment Corporation (25%)—more available to management and employees. This project was supposed to create more benefits for plantation workers, but almost nothing has changed. 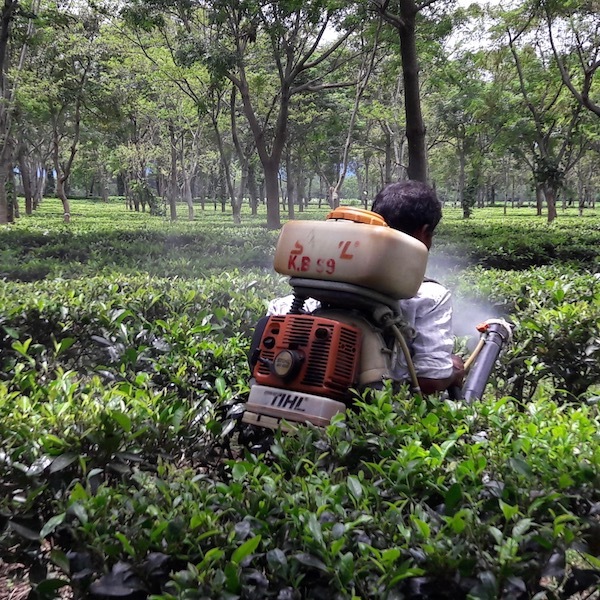 A tea worker sprays pesticides without protective gear on an APPL plantation. Several specific incidents of abuse gave rise to demands for justice on the tea gardens. The first incident took place on 9 August 2009 when a pregnant tea garden worker at the Nowera Nuddy estate in West Bengal, who had allegedly made a request for maternity leave at an APPL clinic, collapsed at work in the field. This event led to a labor dispute and a subsequent lock-out that started mid-September of 2009 and lasted a total of three months. The second incident relates to a 25-year-old worker at the Powai estate in Assam who collapsed and died at work on 28 May 2010 after allegedly being assigned to pesticide spraying duties. Later that day, workers protested and clashed with police, leaving two protesters shot dead and at least 18 others injured. In February 2013, three local civil society organizations filed a complaint to the IFC’s Compliance Advisor/Ombudsman (CAO). The complaint raised concerns about inhumane labor and working conditions at three different plantations, specifically citing long working hours, inadequate compensation, poor hygiene and health conditions, coercion and pressure of workers, and a lack of freedom to association, in violation of IFC rules. Furthermore, the complaint raised concerns about the worker-shareholder program. Workers have been pressured into buying shares, often without proper information about the risks of such an investment. Accountability Counsel’s engagement began shortly thereafter, when the local organizations reached out to us for support with the CAO process. In April 2013, the CAO visited Assam and met with workers, civil society groups, and company representatives. The CAO delegation was composed of Andrea Repetto Vargas, the case’s lead CAO dispute resolution specialist, and Ashok Panikkar, a mediator from Meta-Culture in Bangalore, India. In the weeks following the first CAO visit, several workers reported incidents of retaliation and began to fear attending meetings and participating in the process. Civil society groups immediately reported these incidents to the CAO. This led to the CAO facilitating a meeting in July 2013 between civil society groups, complainants, and APPL management to discuss ground rules to finalize the assessment. In late June and early July 2013, a second CAO delegation, which included Prabha Sankaranarayan, a mediator from Bangalore, and Susana Rodriguez, a CAO associate operations officer, conducted a site visit to finalize the assessment and decide whether to go forward with dispute resolution or compliance review. The CAO delegation met with trade unions, NGOs, workers from several different plantations, student associations from the tea gardens, garden managers, and APPL senior management. They also visited the tea garden worker living quarters. Workers requested additional time to make a decision on whether they wanted to pursue dispute resolution or compliance review. Fear of retaliation played a major role in this decision. The CAO facilitated a meeting between NGO complainants and APPL management in July 2013 to discuss ground rules to finalize the assessment. Despite workers’ repeated requests to initiate a dispute resolution process, no progress was made on addressing the retaliation against workers on the plantations or reaching an agreement on the role of supporting organizations in a dialogue process. APPL ultimately refused a dispute resolution process where workers were accompanied by their selected representatives — including Accountability Counsel. Woman plucks tea in Assam, India. Photo credit: Former AC Law Fellow, Rebecca Gerome. In February 2014, Accountability Counsel contributed a supplement to the complaint that outlined the numerous policy and legal violations on the plantations. In late August 2015, the CAO’s compliance review team, represented by a consultant, Patrick Flanagan, visited tea plantations in Assam. In addition to visiting workers’ living quarters, schools, crèches, and hospitals, Flanagan met separately with workers, supporting organizations, and company representatives. Accountability Counsel supported the tea workers and local organizations through the preparation for and during the visit. In September 2015, Accountability Counsel supported to file additional information outlining the IFC’s failures to meet its due diligence and supervisory obligations, including several enclosures, which are available here. In November 2016, the CAO released its investigation report. While noting that the IFC’s investment had potential for significant development impact, the CAO’s investigation identifies a number of ways the IFC’s assessment and management of environmental and social risk associated with the investment was not compliant with IFC policy. It found that the IFC’s pre-investment review of the risks was insufficient given the vulnerable status of workers and APPL’s responsibility to provide a range of basic services to them. The CAO also found a number of non-compliance findings in relation to the IFC’s supervision of living and working conditions on the plantations, reported use of banned pesticides, information disclosure, consultation, and response to security incidents. The complainants and their supporting organizations released a campaign website to bring attention to the issues raised in the report. The IFC has released a public response to the CAO’s investigation report, which is limited in scope and fails to address all the findings. In January 2019, the CAO released a monitoring report finding that IFC’s supervision since the completion of the CAO investigation report has been unsatisfactory, and that IFC has not delivered on specific commitments included in its response to the CAO investigation. For the CAO’s status of the case, please visit the CAO webpage. Learn more about the CAO accountability office process in this case and our impact. PAJHRA stands for Promotion and Advancement of Justice, Harmony and Rights of Adivasis. Founded, led, and comprised mostly of Adivasis, or indigenous people of central India, PAJHRA aims to empower Adivasis, promote their rights, and improve their status in North East India. People’s Action for Development (PAD) seeks to achieve an equal and just society through a participatory approach in the development process, and through empowerment of the Adivasis and rural poor in Assam, India. Columbia Law School’s Human Rights Clinic and Human Rights Institute supports and influences human rights practice in the United States and throughout the world. As part of their work on Human Rights and the Global Economy, the Institute has investigated conditions at more than a dozen plantations in Assam and West Bengal. Nazdeek is a human rights organization committed to bringing access to social and economic justice closer to marginalized communities in India. Through on the ground legal support to grassroots organizations, Nazdeek develops strategic litigation and builds community-based networks to increase accountability. The IFC issued a letter of response to the CAO Monitoring Report. On 27 April 2018 – the ninth anniversary of the IFC’s investment in APPL – Accountability Counsel supported the complainants to submit a letter to the CAO. The letter demonstrated that the IFC has systematically neglected its duties to address the findings reached by the CAO and highlighted a series of deaths and accidents that recently occurred under the IFC’s watch. Accountability Counsel and partners delivered a petition with more than 67,000 signatures collected by the Care2 social networking website to the IFC. This petition called for the IFC to urgently remedy the situation and ensure that APPL’s tea plantations meet the social and environmental standards required by the IFC Performance Standards. In August 2017, Accountability Counsel and partners released a report titled Project AccountabiliTEA at a well-attended press conference in Kolkata the day before APPL’s annual meeting. The report drew attention to the fact that the IFC had yet to keep its promises to workers. Using photographic evidence, the exposé reveals that the World Bank had broken its promises yet again. At that point, workers on APPL plantations were continuing to face oppressive living conditions, unfair wages, and the curtailment of fundamental freedoms. Accountability Counsel and parters met with workers from three APPL plantations in Assam to verify whether the limited promises under “Project Unnati” were being fulfilled. On 7 November 2016, the CAO released its investigation report on this case. While noting that the IFC’s investment had potential for significant development impact, this report identified a number of non-compliances related to the IFC’s assessment and management of environmental and social risk associated with the investment. It found that the IFC’s pre-investment review of the risks was insufficient given the vulnerable status of APPL’s workers and the company’s responsibility to provide them with a range of basic services. The CAO also found a number of non-compliance findings in relation to the IFC’s supervision of living and working conditions on the plantations, reported use of banned pesticides, information disclosure, consultation, and response to security incidents. The IFC released a public response to the CAO’s investigation report that disagreed with many of the findings, as explained in Accountability Counsel and partners’ joint press release. The IFC was supposed to create an action plan that would directly, and in a timely fashion, address the CAO’s findings. Unfortunately, its response, released alongside the report, was very limited in scope. It largely mirrors an action plan agreed upon by Tata Global Beverages and APPL in response to a Tata-commissioned audit in 2014 conducted by an NGO called Solidaridad. The action plan, known as Project Unnati, had failed to bring meaningful and timely improvements to the workers’ lives. Rather than addressing the root causes of workers’ poverty as highlighted in the report, the plan prioritizes a few actions relating to human health indicators over the next two years, including housing improvements, sanitation facilities, and access to clean water. Accountability Counsel supported complainants to submit additional information outlining the IFC’s failures to meet due diligence and supervisory obligations. The letter contains several enclosures, which are available here. The CAO’s compliance review function, represented by a consultant, Patrick Flanagan, visited tea plantations in Assam. In addition to visiting workers’ living quarters, schools, crèches, and hospitals, Flanagan met separately with workers, supporting organizations, and company representatives. Accountability Counsel supported complainants to submit a supplement to their original complaint, outlining APPL violations of IFC standards, domestic and international law to the CAO in advance of their investigation. Columbia Law School Institute for Human Rights releases “The More Things Change…”: The World Bank, Tata and Enduring Abuses on India’s Tea Plantations,” an extensive study of labor and human rights violations on APPL plantations. Responses from the IFC and APPL are also available. CAO completed their assessment report, transferring the case to the compliance function and therefore ending the possibility of dispute resolution under the CAO. In late June and early July 2013, a second CAO delegation, which included Prabha Sankaranarayan, a mediator from Bangalore, and Susana Rodriguez, a CAO associate operations officer, conducted a site visit to finalize the assessment and decide whether to go forward with dispute resolution or compliance review. The CAO delegation met with trade unions, local groups, workers from several different plantations, student associations from the tea gardens, garden managers, and APPL senior management. They also visited the tea garden worker living quarters. Workers requested additional time to make a decision on whether they wanted to pursue dispute resolution or compliance review. Fear of retaliation played a major role in this decision. The CAO facilitated a meeting between the complainants and APPL management to discuss ground rules to finalize the CAO’s assessment. At issue were the ground rules that needed to be agreed to finalize the assessment for a dispute resolution process. Despite workers’ repeated requests to initiate a dispute resolution process, no progress was made on addressing retaliation against plantation workers or reaching an agreement on the role of supporting organizations in a dialogue process. APPL ultimately refused a dispute resolution process where workers were accompanied by their selected representatives. The CAO visited Assam and met with workers, local groups, and company representatives. The CAO delegation was composed of Andrea Repetto Vargas, the case’s lead CAO dispute resolution specialist, and Ashok Panikkar, a mediator from Meta-Culture in Bangalore, India. In the weeks following the first CAO visit, several workers reported incidents of retaliation and began to fear attending meetings and participating in the process. Local groups immediately reported these incidents to the CAO. CAO found the complaint eligible for further assessment and an Ombudsman assessment began. 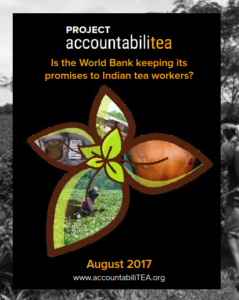 Community organizations, PAJHRA, PAD, and DBSS file a complaint to the World Bank Group’s Compliance Advisor Ombudsman (CAO) on behalf of tea garden workers in Assam, India. The complaint raises concerns about inhumane labor and working conditions at three different plantations. It specifically cites long working hours, inadequate compensation, poor hygiene and health conditions, coercion and pressure of workers, and a lack of freedom to association. All of these conditions violate IFC Performance Standard 2 (PS2). Furthermore, the complaint raises concerns about the worker-shareholder program. Workers had been pressured into buying shares, often without proper information about the risks of such an investment. The CAO publishes a compliance appraisal report on a parallel process regarding APPL. The CAO finds that a full audit is merited. A report titled “In Cold Blood: Death by Poison, Death by Bullets” is published on human rights violations on Tata/Tetley-controlled tea estates in Assam, India. A 25-year-old worker at the Powai estate in Assam collapsed and died at work on 28 May 2010 after allegedly being assigned to pesticide spraying duties. Later that day, a protest and a clash with police broke out, resulting in two protesters shot dead and at least 18 others injured. Setting the stage for tea workers to speak out and demand fair living and working conditions, on 9 August 2009, a pregnant tea garden worker at the Nowera Nuddy estate in West Bengal, who had allegedly made a request for maternity leave at an APPL clinic, collapsed at work in the field. This event led to a labor dispute and later, starting mid-September, 2009, a lock out totaling three months in duration. Since 2013, Accountability Counsel has supported local civil society organizations in Assam to amplify the voices of tea workers on plantations who live like modern-day slaves. Our work ensured that the IFC’s accountability office, called the Compliance Advisor Ombudsman (CAO), had all the facts needed to demonstrate that the IFC’s investment in APPL violated IFC social and environmental rules. The impact thus far is a formal record — the CAO’s investigation and monitoring reports — that we are using to push the IFC and the tea plantation owners and operators to act. Our work has also raised awareness of the inhumane labor and working conditions on the plantations. 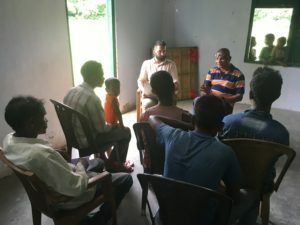 Following the CAO report, Accountability Counsel’s South Asia team worked with partners in Assam to build a public campaign to garner solidarity for the tea workers, including through press coverage and a campaign website at AccountabiliTEA.org. Our campaign to hold the company accountable received attention in many major domestic and international news outlets, including the New York Times, the BBC, and the Financial Times. Despite the scathing report from the CAO in 2016 demonstrating numerous violations of IFC policy on the tea plantations in Assam, there has been minimal action by the IFC to address the concerns outlined in the report. We have not been satisfied with this result and our work continued. Our South Asia team worked to create a follow-up report on the tea company’s attempts to downplay the problems on APPL’s plantation. In August 2017, we released that report with our partners titled “Project AccountabiliTEA” at a well-attended press conference in Kolkata the day before APPL’s annual meeting. This report drew attention to the fact that the IFC had yet to keep its promises to workers. In November 2017 — a year after the CAO report’s release — we delivered a petition with more than 67,000 signatures collected by the Care2 social networking website to the IFC, calling on the IFC to urgently remedy the situation. In April 2018, we supported the complainants to submit a letter to the CAO demonstrating that the IFC has systematically neglected its duties to address the findings reached by the CAO and highlighted a series of deaths and accidents that recently occurred under the IFC’s watch. With the January 2019 monitoring report confirming continued failures by the IFC to provide remedy, we continue to work toward a fair and credible consultation process for workers to have input in improvement measures going forward, and to raise systemic problems with IFC’s role in abuses at the highest levels of the World Bank Group.